Alexis Bass’s heartbreakingly beautiful second novel is a tale of love, loss, and learning to forgive, perfect for fans of Gayle Forman and of Robyn Schneider's The Beginning of Everything. A year and a half ago, Amanda Tart's brother got behind the wheel drunk and killed his best friend. Today, he's coming home from prison. Amanda's been the one living with the fallout, made worse by her brother's recent unapologetic TV interview. People think he's a monster. Still, she loves him. It's her dark secret, until she starts getting close to Henry again--whose sister is paralyzed from the accident. A year and a half ago, her brother destroyed his life. Now Amanda has to decide if she'll let his choice destroy hers. First of all, I want to thank HaperCollins for the e-arc I received. I loved the book so much, I just couldn’t stop reading it and finished it within two days. Thanks! The synopsis of this story really spoke to me, since it told the story not from the perspective of the person who did something wrong, but from the person being closest to it, having to live with the consequences. I like Amanda from the beginning, though I must say, some decisions she makes are doubtful. But that’s certainly something that makes a story interesting: characters making mistakes. But what’s special about this story, is that Amanda practically really didn’t do something wrong to start with. Her brother did. But she partly blames herself for it. Her brother, back from jail, is getting bad again, and she wants to save him. She wants to do the right thing, she just overthinks it. Author Alexis Brass perfectly depicts this with the passages of Amanda writing text messages to her best friend Dawn, deleting them until sending a message that’s completely lost its meaning. Her brother, Jonathan, really was hurt by what he did. He just doesn’t handle things well and you just see him slipping away. Another important character to the story is Henry, though I still don’t feel like I know him very well. It’s only until one of the very last pages that I felt like I understood him. But I think Alexis did a good job on creating interesting characters to write her story around. The story, the plotline, was okay. I was slow, here and there, but it contains some action too. It’s balanced out quite well, though some parts were not very interesting and I wanted to skip to something new. But overall, I think the story line was okay. I did miss a climax – it was only until after I read the climax I realized it read it. So that’s something I think could’ve been improved by being more dramatized or something. But then again: this was very realistic. The writing style of Alexis is great. I loved it. It was easy to read, smooth, not laying it on too thick that you’re reading a book. It wasn’t trying to sell itself of being more than it really is. The writing was very honest, and that makes this book so enjoyable to read. I think this book tells an original story, written in an easy breezy style, which will make you adore the story. It deals with deep problems, and will make you rethink life again. I’d recommend this book to all of the John Green lovers who’d like to read something real, but don’t need some sappy love story (because it’s not). This is a YA novel that has layers and I really value that. What’s Broken Between Us is a great addition to the Young Adult genre. Being Jonathan Tart’s little sister used to be a good thing, the kind of label that offered protection in high school. Now, a year and a half after he got behind the wheel of a car while he was drunk and killed his best friend, being his little sister means putting on a mask and dealing with the fallout of his unapologetic interview. Amanda Tart still loves her brother and wants to protect him but as she starts getting closer to Henry, a former flame and the boy whose sister was paralyzed in the accident, she starts to see that maybe protecting her brother is destroying her own life. Before I started this book, I was a little worried it would be too similar to Sarah Dessen’s Saint Anything. Both involved the younger sister of a popular boy who’d driven drunk and got caused an accident. Both involved the sister having to figure out who she was outside of being that boy’s little sister and having to deal with the consequences of his actions. There were obvious similarities but overall, the characters and the way they handled the situations that arose were very different and made this book feel different. Amanda for the most part was a likeable and sympathetic character. She didn’t always make the smart choice but she was dealing with a lot so while I didn’t always agree with her, I could understand her viewpoint. The fact that the book was told in her POV also made the character of Jonathan more than just the drunk driver. We saw how his actions affected the whole family, including him, and how they struggled with wanting to help him versus pushing him too hard. There were many times throughout the book when I wanted to shake some sense into the characters, especially Jonathan and Amanda’s parents. Their son was home after an extremely lenient sentence and was spiraling and they were nowhere. I could understand their fear of being too harsh and pushing him away but their inaction just made it easier for him to continue his downward spiral. From the flashbacks and some moments with Amanda, Jonathan seemed like a decent guy who just loved to party, made the biggest mistake of his life, and now had to deal with what had happened. And no one was making him face it so he used any way he could to avoid it. I didn’t enjoy the cheating that came from the attraction between Amanda and Henry, Sutton’s brother who was also Jonathan’s girlfriend before the crash. I did like them together, but as least have the decency to break up with your girlfriend and boyfriend before jumping into a new relationship. With everyone making such horrible decisions throughout the book though, it made sense for cheating to eventually come up. Overall, it was a good book filled with character growth for Amanda and the kind of book that can remind its reader that judging a character’s actions is easy when we’re not in the same position. Liked it but had some issues. 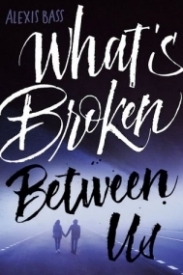 I wanted to read what broken between us because I am drawn to the darker and have your contemporaries like this one. I wasn't sure if I sit with the focus was going to be on because the synopsis was a little bit make it mentions her brother who was the drunk driver in an accident that killed someone and left his girlfriend paralyzed. The main character was okay and I can understand her hardship and trying to deal with the school seeing her brother as the bad guy hearing them say that she deserved more time in prison and that there's a lot of focus on an interview that he did for TV where he sounded totally unrepentant. but at times I feel like she was just not like I didn't really get a big tip to the motion from her you know she would say that stuff made her upset that she had to put on this face for the public. Her brother Jonathan is definitely intriguing when he is let out of prison we see a young man who is broken who is sorrowful who is driving himself and alcohol still and he's trying to find his way back to some semblance of a real life he is trying to be close with his sister and he's just stuck in this pretty low place. I feel like in the beginning we get a lot of characters thrown at us and it's hard sometimes to keep them separate whenever I don't have a good feel for the main character. there is her best friend who is off at college, there's the girl grace who died, there Sutton who was Jonathan's girlfriend who was.injured. even more confusing is her boyfriend Graham and her I don't even know what to call him... Henry. They flirted back and forth a lot and I think that they used to have more of a connection but now she's with Graham but Henry continues to be in the story and it was kind of hard to figure out where he fit into everything. The cheating in this one bothered me, and wish that it would have been absent, because I don't think that it really added that much as far as character growth. The ending was well enough, but I wish that Jonathan would have made some different choices. Amanda had learned some things about herself and was on the way to make some decent changes as a result. Bottom Line: Liked it but had some issues.